Set in a dystopian world, Final Fantasy VII's story centers on mercenary Cloud Strife who joins with several others to stop the megacorporation Shinra, which is draining the life of the planet to use as an energy source. 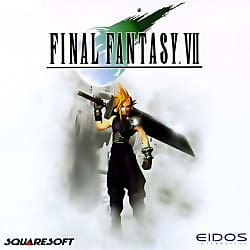 As the story progresses, the situation escalates and Cloud and his allies face Sephiroth, the game's main antagonist. Video games are made or broken by the text that tells their stories. This is the story of 8 different games and franchises with some serious translation problems and how those errors came to be. Nintendo unveiled a slate of new releases and launch dates at its latest Nintendo Direct. Here's a quick recap. The company's retro emulator will feature 20 pre-loaded games, including Final Fantasy 7, Grand Theft Auto, Metal Gear Solid, and Resident Evil. Square Enix is releasing new and remastered Final Fantasy games for all three consoles. Got a hunger for a great video game reference? Arby's outserves the competition with a host of hilarious (and sometimes jaw-dropping) game and anime art! Black representation is very lacking in gaming, with there not being a lot of playable black characters. This is a problem that needs to be addressed. Interested in getting the best gaming plush? Let us guide you in the right direction. For friends of fans of Final Fantasy, this gift guide sets out to help people pick out that perfect gift for those who can't get enough of the Final Fantasy games. Final Fantasy VII just celebrated its 20th birthday, so we asked some of our staff to reminisce about their first experiences with Square's timeless classic. In a world where princesses become princes and heroes become heroines, check out these amazing genderbending cosplays from video games! It's a Father's Day grudge match to the death - who will come out victorious? While the RPG genre remains strong, you might need to look past AAA offerings in order for that to be apparent. With the new Magitek armor DLC coming soon I look at some of the most useful armor and equipment sets in the Final Fantasy series. Overwatch may have dominated 2016 but what's looking like the top bid for cosplay glory this year? Here's a look at what you can probably expect! These are the JRPGs which are coming to the US in 2017. Can't get enough of Japanese storytelling? Why not fill your craving with these Japanese RPG titles? 2017 has some enticing new releases on the calendar. But before we dive into the new year, let's take a look back at games released in 1997 aka games that will turn 20 this year. JRPGs are a great source of wonderful companions. Here are a few that don't fill that role very well. These Are the Cosplay Ideas for 2017!